IT’S 8.25 on a heavenly Wednesday morning when I drive into Tabulam Golf Club’s car park and pull into a parking spot just metres from the “clubhouse”. Well, truth be told, there isn’t really a clubhouse – it’s actually a shed with a few tables and benches, a local rules chalk board and a section where machinery and few old golf clubs are stored. I’m hoping the parking spot isn’t reserved for club president Chris Beasley, whom I’ve arranged to meet. Unlike most clubs in the “big smoke”, Tabulam Golf Club doesn’t reserve parking spots for its committee members. In this picturesque rural village (population around 500) in the far northeast of New South Wales it is first in, best dressed. I’ve always wondered why committee members are allocated parking at the entrance to the clubhouse ahead of paying customers, members and the disabled. Tabulam Golf Club member Brian Godden is first to arrive. Brian, along with playing partners Arthur Ramsay and Irishman Denis O’Rourke, play golf three times a week. Today they are the only players on the golf course, but come Saturday there’ll be around 20 playing. That’s 80 per cent of the membership. 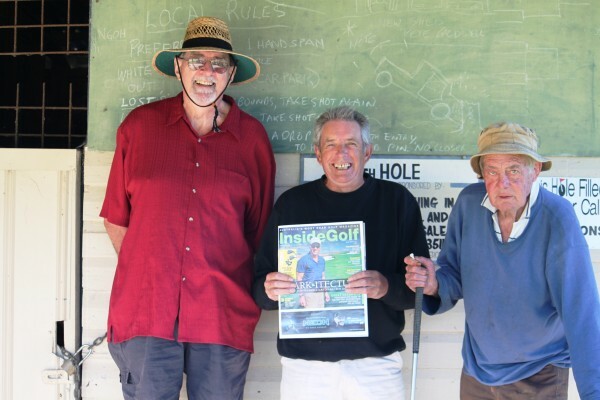 Brian Godden, Denis O’Rourke and Arthur Ramsay pose at the 19th hole with a copy of Inside Golf. I reintroduced myself to Brian, whom I’d met a day earlier in the middle of the shopping precinct’s main road outside the Hungry Gecko Café and diagonally opposite the pub. The café is where Brian, Denis and Arthur rendezvous for coffee and a bite to eat after a round. While waiting for president Chris to arrive, Brian gives me a brief tour of the course. He tells me he is a musician who played in a number of bands in the 1960s before taking his talents to America where he spent 40 years in the music scene. “I played guitar for the Raiders, the Daily Planet and a few other bands in Sydney and Melbourne before going to America,” he said. “Arthur (Ramsay), who you’ll meet later, managed one of the bands. We reach the seventh hole and Brian points out a small, disused cemetery. One headstone reveals a local policeman was lost in a flood 150 years ago. This month, the club will hold a memorial golf day to remember him. Out on the golf course, it’s dead quiet. There’s no passing traffic, no houses encroaching on the fairways, no mobile phones ringing and no worries. Brilliant. To reach the fairway from the seventh tee, players have to hit over water. “We call it Death Valley … for obvious reasons,” Brian laughs. The short nine-hole course is without bunkers, but does have out of bounds on five holes – the first, second, third, seventh and ninth. Other hazards include Pinball Alley (between the third and fourth holes) and the Bermuda Triangle (fourth, fifth and sixth). “If you drive it into the trees between the third and fourth holes, your ball could bounce around in the trees until you get out,” Brian said. Back at the shed, secretary Steve Symonds, the local weather man, arrives and tells me Tabulam Golf Club first opened in 1992 when a keen band of potential golfers leased land from the local real estate agent. The club purchased the land and a bit more in 1996 and redesigned the course. The 25 loyal members pay an annual fee of $60 and $6 to play in the Saturday competition. Visitors’ green fees are $6. “If you intend having a game, bring your own clubs,” Steve advised. Just after 9am, volunteer Allen Bell, who helped redesign the course, turns up with his loyal dog Sally in tow. Where 88-year-old Allen goes, Sally follows. He’s here to mow the fairways and kill the weeds. In years past, prison farm inmates would arrive to whipper-snipper around the course before playing nine holes. “They loved it,” Steve said. President Chris, who drives the school bus, arrives and tells me he has been president “on and off” for 20 years. “We have been blessed with good rain so the golf course is in good condition,” he said. Steve says the secret to a good score is to “hit the ball straight”. 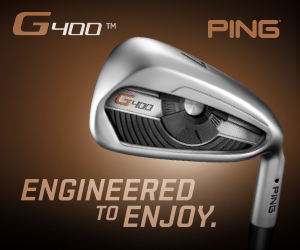 “Usually, I get around using only one ball because mostly I hit them straight. “Mind you, I have the record for losing seven balls and racking up a score of 23 on seventh hole,” he laughed. “The dam across the seventh fairway is a ball magnet and so is the tree in the fairway. The club’s biggest event is the Father’s Day Ambrose, which helps raise money for the Fire Brigade. “We get 50 or 60 play and people who don’t even play golf come along to support the event,” Chris said. Then there’s the Tabulam Golf Club’s 72-hole club championship, which is like no other. The members decide when they want to play eight nine-hole rounds as long as it’s during the month of May and they are with another member. And once a year, Tabulam members take on golfers from Bonalbo – 26 kilometres away. 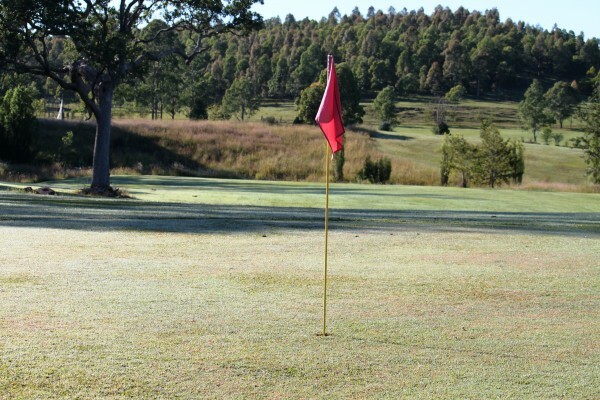 For golfers seeking an 18-hole golfing experience, Casino and Tenterfield golf clubs are 40 and 50 minutes away respectively. Long before the arrival of Tabulam golf course, there was a makeshift golf course at nearby Drake – 20kms down the road. Drake’s oldest resident, raconteur and bel-esprit Edna Lawrence, 94, told me she had a golf course on her vast property just off the Bruxner Highway. Cows now graze on the grass where golfers once took divots. I ask Steve and Chris what’s the best thing about Tabulam Golf Club. “The friendliness,” both say, almost in unison. “No one cares how good or bad you are at golf,” adds Steve. The 19th hole might be a small shed, but the camaraderie around the club is fantastic. Chris says there is a warm, clubby atmosphere on Saturdays. The members would love a traditional clubhouse, but that’s not going to happen any time soon unless Steve wins Lotto. “I have said that if I win Lotto the club can have my house, move it over here and I’ll build a new one,” Steve laughed.